To write well, one must have leisure: leisure to read, leisure to think, to talk things over, to talk oneself in and out of a position, to compose and rewrite and polish, to travel, to observe, to listen, to let the sounds and voices sink into oneÃƒÂ¢Ã‚Â€Ã‚Â™s consciousness until they are ready to come out again, having “suffered a sea-change.” All this requires leisure, and leisure is an expensive commodity. Discovered via a comment left by purpleslurpee on charlesatan’s essay on writer’s block. September 1 is Labour Day in Canada, so it’s a holiday. Aside from that, I usually try to keep my consulting to a reasonable number of hours, so sometimes I’ll end up with a weekday I’ve promised to devote to things that are not work. I find that I tend to get caught up in work sometimes, especially when I’m programming. Then it’s hard to think of what I’m missing out on. Other times, I settle into comfortable routines. A list of activities helps me notice things I haven’t tried in a while. I’m coming up to the 4-year mark of this 5-year experiment with semi-retirement. The start of the final year might even neatly coincide with the next substantial change I’ve been planning. I’ve been very lucky to have had this opportunity to explore, and it’s a good opportunity to reflect on self-direction and leisure. This past year has been a little like the openness of my final year of university, when my habit of taking summer courses freed up half the typical academic load for the schoolyear and I had plenty of time to explore open source development. This time, I had even more autonomy. No exams to study for, no projects to submit; just choices. I’m learning that my physical state strongly influences my mental state, which then strongly influences how I use my time and how I feel about that use. If I’m tired or fuzzy-brained, I won’t get a lot done. 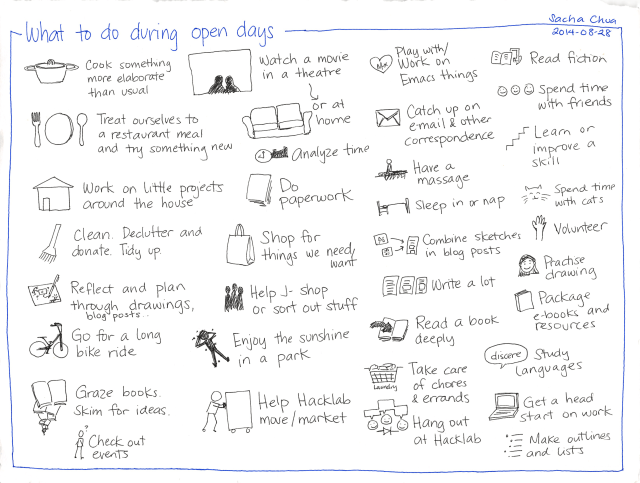 I’ve learned to make better use of fuzzy-brained times by keeping a list of small tasks I can do, like housework. 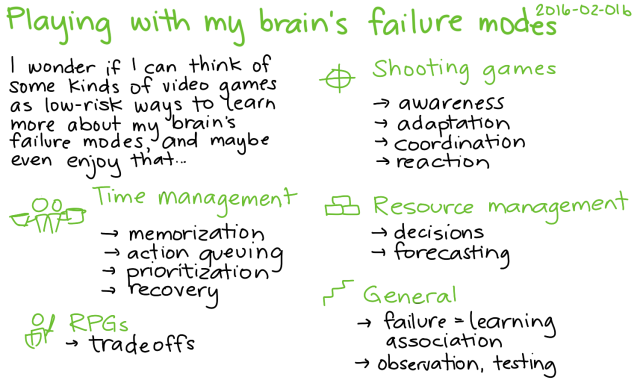 I invest some of my alert time in building the systems and processes to help me when I’m fuzzy-brained, too. Long-term, I’m probably well-served by investing more time in health. I’ll rest when I need to. Beyond that, if my mind’s not as active or as energetic as I’d like, there’s always working on my energy. I’ve come to enjoy a lot of different kinds of discretionary time. I think I don’t need a lot of pure leisure, at least not the vegging-out kind. I definitely like having a lot of discretionary time – to be able to choose what to do when – but even the things we do for day-to-day living can be enjoyable. I will probably have less absolute time for leisure and less control of my time in general, but I think I’ll be okay. Because of this experiment, I’ve been learning that time probably isn’t my limiting factor when it comes to things like writing or learning or making things. It’s probably more about curiosity, observation, motivation, and experience, and those are things that I can develop through the years. Reading: nonfiction, fiction, random Internet browsing. Dusted off my Kindle and loaded it up with a few tech manuals and some fanfiction. Great for walking around, since I can use the page buttons even with gloves on. 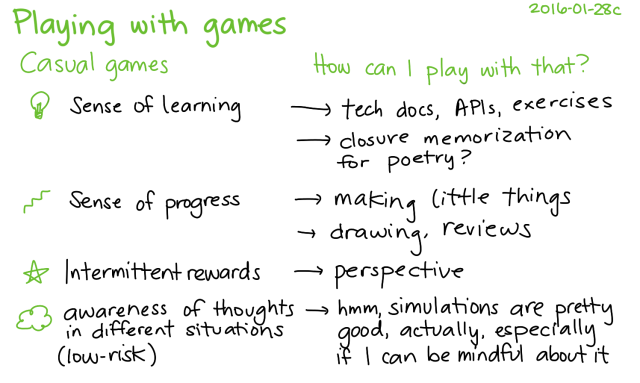 I think games are worth thinking about a little more, even though I’m tempted to focus on the more useful activities. There are a lot of people who spend a lot of time thinking about how to make gaming more engaging. It’s a big industry. I wonder if I can turn it to my own purposes. I tend to like games with stories that have funny moments, like RPGs or LEGO games. Since games like that tend to require space and development effort, I play them on the PSP or the PS3. I’ve learned I’m not a completionist when it comes to achievements or levels – I like passing a level, but I’m not driven to reach three out of three stars. I can enjoy open-ended sandbox simulations. 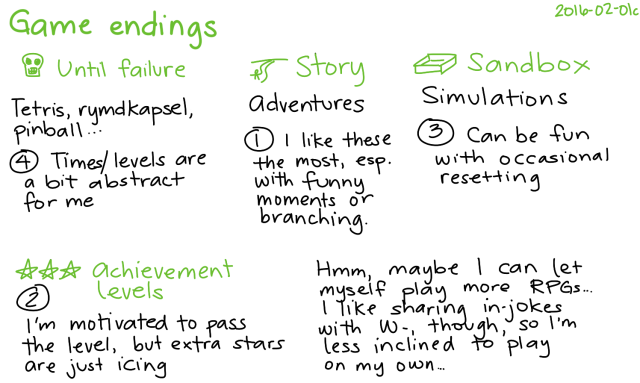 Games that go until failure tend to be a little depressing after a while – the abstract achievement of lasting a certain time or reaching a certain level doesn’t tickle my brain the same way other things do. Reflecting on the specific games I’ve liked, I notice that I usually explore games that W-‘s also playing as a way of spending time together or sharing experiences. This is how I ended up getting into Borderlands 2 and Persona 4 Golden, and why I’m playing Final Fantasy IX now. On my own, I find that I’m a little partial to time- and resource-management games. 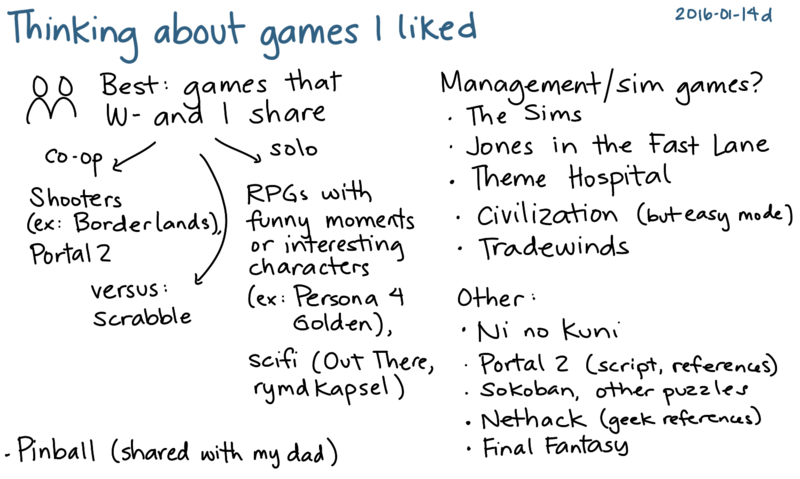 I figure that among the popular games of those genres, a game is probably as good as any other. So I’m playing through Rising Star Chef on the tablet, and just for kicks (and Takei’s narration, although there’s far too little of that), Star Trek: Trexels on my phone. It seems like most of the popular games have switched to a freemium model, with in-app purchases for the impatient. I find myself liking the built-in timers and rate limits, actually. They’re good for reminding me to surface from the game and look around. There’s a little bit of pride, too, in the thought: “Aha, I resist your feeble attempts to convince me to spend money.” But that’s only part of the picture, of course. I pay in time and attention, and often in exposure to advertisements. So if I’m going to do this, I want to make sure that I get what I want out of it. Here are the pay-offs I think I’m getting from these games, and some alternatives if I want to play with those pay-offs. Games give me a sense of learning and a sense of progress, although they’re of arbitrary things. 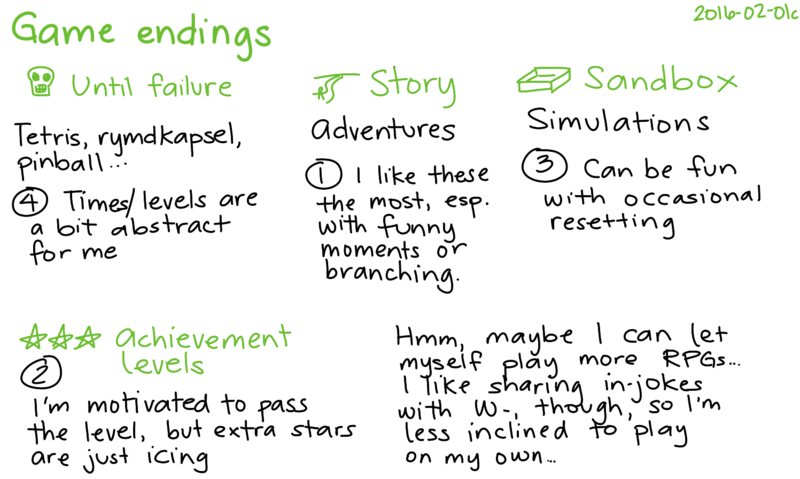 Games also deliberately build on the rush of intermittent rewards. The most interesting benefit for me, though, is developing an awareness of how I think in different situations, while keeping things low-risk. Sometimes I catch myself getting flustered and messing up orders in the cooking game, or letting a party member get knocked out in FF9 because I was too distracted to pay attention to the health stats. (Trexels seems more like a virtual pet than anything else; it feels like it’s just a matter of time.) I like the way games make me think a few steps ahead, take risks, recover from mistakes, and deal with (or even celebrate) the inevitable failures.